The 2015 UN Climate Change conference in Paris begins this upcoming Monday. In the midst of this event the Quebec government is currently holding a controversial stance on energy transition. Many new studies, about 4000 pages long, have been made public very recently. Continued fossil fuel use in Quebec is an issue that needs wider public discussion. The Quebec government seems to be more interested in continued fossil fuel exploitation and consumption rather than using cleaner alternatives. The goal is to nearly eliminate all usage of fossil fuels by 2050. Many public organizations, including the David Suzuki Foundation, are concerned that they have been given such short notice to provide a proper strategic environmental assessment on the usage of fossil fuels and transitioning towards cleaner alternatives. Jean-Patrick Toussaint, the spokesperson for the David Suzuki Foundation, provides some more insight on our goals for the future considering the current economical and environmental status in Quebec. This is an ongoing assessment that will continue well after the conference in Paris. The David Suzuki Foundation, as well as other affiliated organizations, plan on furthering the discussion based on what bills will be proposed in the future at the National Assembly concerning fossil fuel exploitation and usage. This interview was produced by Dinith Karunanayake. CKUT – Off The Hour hosts a panel discussion situating the recent November ISIS attacks in Paris and Beirut, along with Hollande’s declaration of war, within the local context of xenophobia and the spike in Islamophobic hate crimes which followed in Canada shortly after the attacks. Kawthar : French-Muslim who has lived and studied in Montreal and also has been involved in various community struggles, including Palestine solidarity work. Sameer Zuberi : member of the Conseil interculturel de Montréal, board member of the Quebec section of the Canadian Muslim Lawyers Association, and has worked in human rights, media relations, education, legal research and the Canadian Reserves. Suraia Sahar : organizer of the Community Rally against Islamophobia and Imperialism, with the Thorncliffe Reach-Out Teach-In in Toronto. Syed Hussan : writer and organizer with No One Is Illegal Toronto and Canada’s Migrant Workers Alliance for Change. Special thanks to Celia Robinovitch, Stefan Christoff, Claudia Edwards and Aaron Lakoff. This recording was produced by Claudia Edwards. In October of 2014, the 17 year old undocumented minor “Daniel” was deported from Canada, after the authorities detained him while visiting his friends at school. Kept in isolation from his family, Daniel was then sent back to Mexico to fend for himself within just over one week. One year later, we speak with Mary from Solidarity Across Borders about the campaign surrounding his case, as well as the broader issue of human rights for undocumented migrants living in Canada. 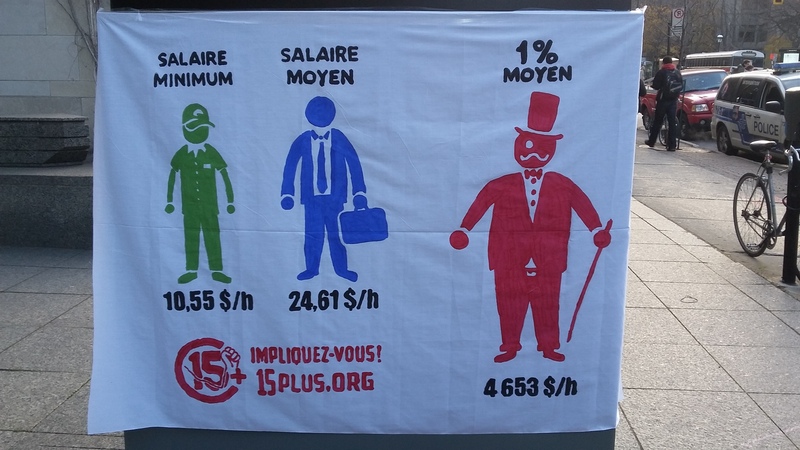 On November 10th, on the other side of the main gates of McGill university, members of the “Coalition contre le travail précaire”, the 15plus.org campaign and many other political organizations in the community of Montreal united to protest the current minimum wage in Quebec. The current minimum wage is $10.55 in Quebec and the idea is to raise that to $15 for all workers regardless of their age, race, gender, job category, or immigration status. Julien Daigneault, from 15plus.org, was present as the first spokesperson leading the speech. Participants encouraged passers by on Sherbrooke street to sign the petition to raise minimum wage to $15 an hour as the protest went on. It’s important to note that the campaign is fairly recent in Quebec, but several states in the USA as well as Alberta have succeeded in having mimimum wage raised to $15 an hour already. Several studies have shown that $15 an hour is the required minimum wage for an individual worker living alone in Montreal to lift themselves above the poverty line and escape debt. This report was produced by Dinith Karunanayake for CKUT Radio.